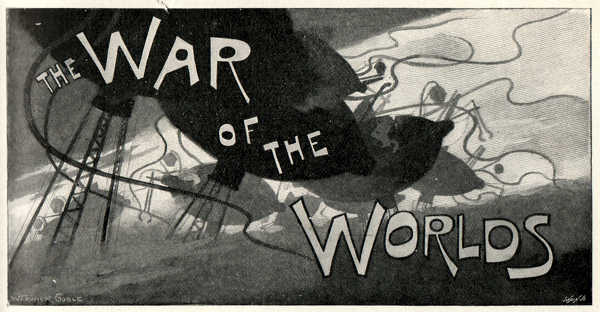 H. G. Wells’ novel The War of the Worlds was first serialised in Pearson’s Magazine in 1897. By sheer luck, many years ago, I came across the complete bound set of that year’s issues in a little second hand bookshop in Ilkley selling for a few quid. So I’m lucky enough to have a copy of the first edition of the book. It’s a lot shorter than the final novel, Wells expanded it considerably afterwards, and the story is still a bit rough round the edges. 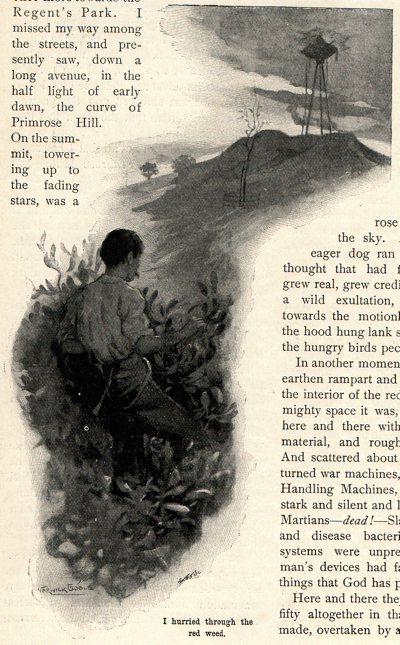 What makes the magazine special, though, are the fantastic illustrations by Warwick Goble. 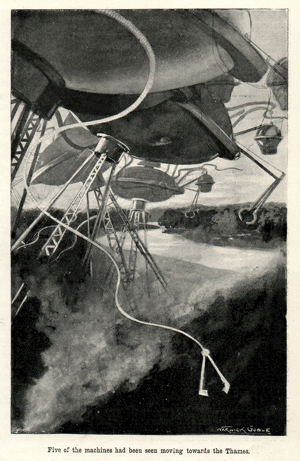 These are the first pictures of the Martians and their tripods and, I think, the best. 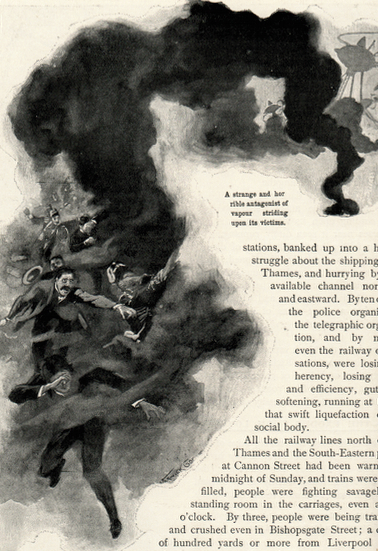 I’ve scanned in a selection of the illustrations so you can see how the invaders looked to the Victorians who bought the magazine to read in their parlours and on the train. 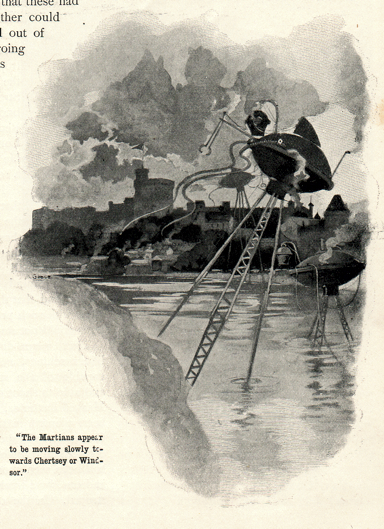 Warwick Goble’s Martians are very simple and functional. I always thought that later versions were too hi-tech and futuristic for the setting of the book. They also showed the Tripod legs as articulated, like a human’s or a spiders. 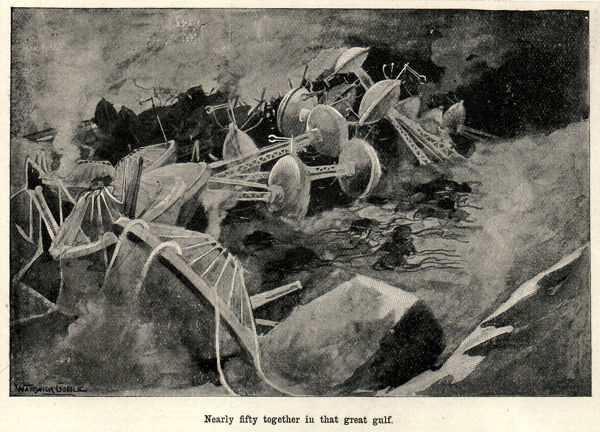 In the novel Wells is at pains to point out that the Martian legs are rigid, which is how Warwick Goble draws them. The images on the left and below show them wading through the Thames and generally causing mayhem round the M25 corridor. 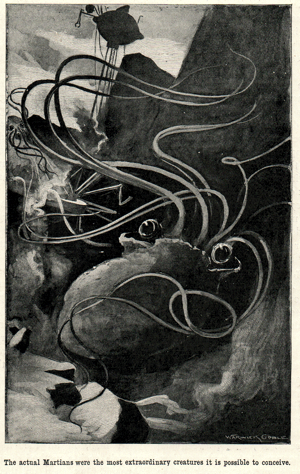 The rest of the pictures follow the sequence of the story, including a rare image of the Martian flying machine, pouring poisonous black smoke onto the land. 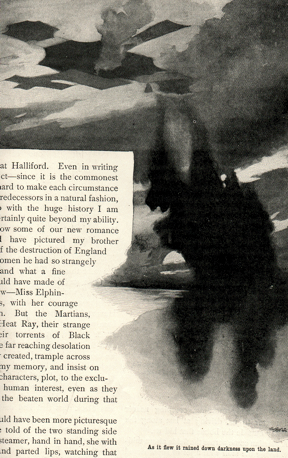 The Martians are a bit too cute, though they are the first attempt to visualise beings from another world. It’s also nice to see a young lady having a pop at the invaders with her Webley revolver instead of swooning into a heap. Love these pictures. As for the legs, while Wells may have described them as rigid, I can understand why most artists made them articulated. It makes more sense. I like to imagine that even Wells would have thought, yes, I guess they’re right. Even Martians need knees. An easy way to imagine how a tripod might walk is to think of a man on crutches with one leg in a cast or missing. Or imagine the contestants in a three-legged race (minus the falling down and laughing parts). Love the pictures – well found. A couple of small things – Wells did, in fact, mention articulation of the legs – when one of the fighting machines wades across the river during the attack on Shepperton, he describes the “knee” of the foremost leg bending as it raises itself up on the bank. 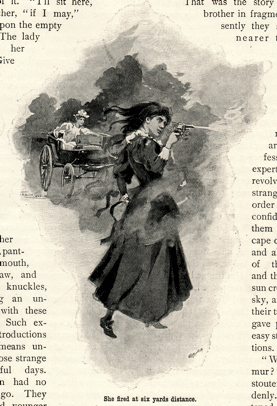 And the damsel – Miss Elphinstone – is firing not at the Martians (that would be brave indeed) but at a group of robbers menacing she and her sister-in-law. Whilst I do think the machines portrayed here look pretty damn cool, I don’t think it’s quite how Wells himself envisioned them. I always felt that he wanted to portray them almost as organic creatures than machines, and thus move very fluently rather than rigidly. In fact he disowned these illustrations because he felt that they looked too different to the Tripods he described in the novel. I mean, where are the baskets they carry for keeping human prisoners? This is great! 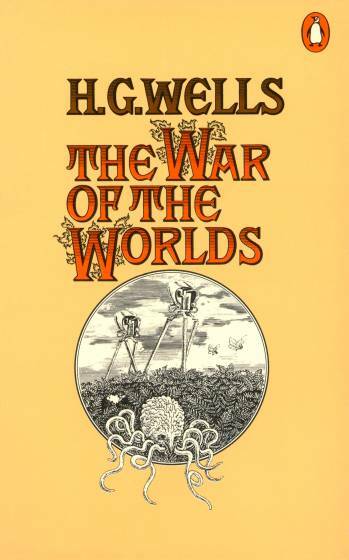 We have to create a project on the Victorians for homework (I am 10 years old) and I chose HG Wells. I wanted to include a picture of a Tripod, yet they all looked far too modern. At last I have found the answer to my problem! I loved how all the characters were dressed in Victorian costume and the flying machines as well as the girl shooting them with a revolver. This will make my project look 100 x better! I am also making a model and finally know what it should look like! Glad to be of help, and good luck with your homework! If you have a chance check out George Pal’s 1960 film of The Time Machine (not the later one with Guy Pierce), which is one of the very few movies of H. G. Wells novels to be set in the Victorian period (at least the first bit, before the hero goes into the future).